India, Ink., has moved. The live version of this post is now located at http://ink.indiamos.com/2010/05/04/three-more-days/. Sorry for the inconvenience! India, Ink., has moved. 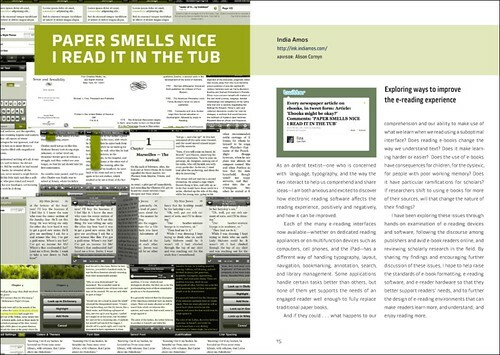 The live version of this post is now located at http://ink.indiamos.com/2010/02/12/e-book-abomination-index/. Sorry for the inconvenience! he quick brown fox jumps over the lazy dog. Hella annoying. And there was an egregious typo in the book, repeated three times in one paragraph. Annoying enough that I dug around on the McGraw-Hill site until I found a place to lodge my complaint. But then I got to thinking, as I filled out their lengthy incident report form, that if I want to report every fucked-up e-book I come across—which is most of them—I could spend the rest of my life chasing around on publishers’ websites for the buried feedback addresses or forms. And then I thought, Why not set up a sort of Hall of Shame where not only I but anyone else who finds a crappy e-book can post the gory details? Ladies and gentlemen, may I present to you the E-book Abomination Index submission form? India, Ink., has moved. The live version of this post is now located at http://ink.indiamos.com/2010/02/02/room-for-improvement-no—wait—airplane-hangar-for-improvement/. Sorry for the inconvenience! Below are slides from a presentation Liza Daly gave at the Digital Book World conference last week. There are elaborative notes on the DBW site. I also want Bookfuturism.com to be a kind of social network for Bookfuturists like me. There are clear markets for writing by techno­logical triumphalists (I call these guys and girls technofuturists) and doomsayers (when it comes to reading, this group can be called book­servatives). It’s easy to give a thumbs-up or thumbs-down to new technology; it’s a lot harder to try to engage with its strengths and weaknesses, to think of ways it could work better, to situate it in his­tory, to study its effect on a culture. Update: Okay, okay, David Lawson had the patience to build a proper website to do this, so I hereby recommend that you swap Wave invitations over there instead of through my improvised gig: WaveShare.org. If anybody here is pining for a Google Wave invitation, some friends and I have pooled our resources and are filling requests as they come in. Post a comment here or at Clusterflock, and I’ll add you to the nomination list. Many of our nominees have been able to sign onto Wave within a few hours; you could be Waving by dinnertime! Don’t know what in tarnation Wave is? This Mashable guide is pretty informative. So far, all I’ve used Wave for is to distribute invitations to Google Wave . . . but it works well for that! Photo: free by tonx; some rights reserved.